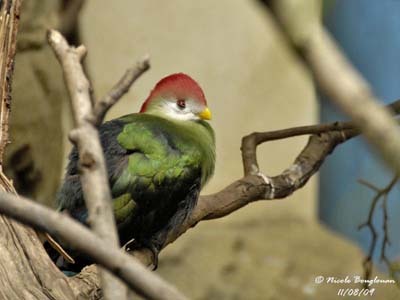 Red-crested Turaco is a medium-sized bird, with characteristic red and green pigmentation, typical in this genus. It is endemic to Angola. This turaco is very similar to Bannerman’s Turaco (Tauraco bannermani), but they differ in crest and face colours. Red-crested Turaco is heavily preyed upon by African Goshawk (Accipiter tachiro), Blue Monkeys and snakes. They are considered as pests because they damage cultivated areas, but on the other hand, they help in seed dispersal. Deforestation also is an important threat for this species. 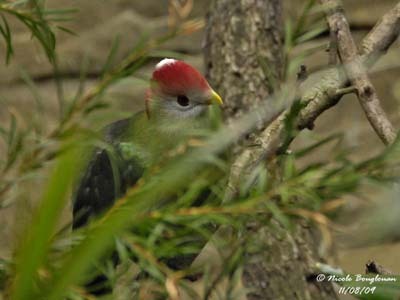 However, Red-crested Turaco is common within suitable habitat at this moment. Adult has green plumage overall. On the upperparts, back and wings are darker bluish-green. Upper back and scapulars are metallic golden-green. Primaries and outer secondaries are crimson and brown-tipped. Rump is blackish with glossy green reflection. Uppertail coverts and rectrices are glossy blue-green. On the underparts, belly and undertail coverts are greenish-black. Breast and neck are pale yellow-green. On the head, lores, cheeks and chin are white. The crown is red ending into a point on the greenish-yellow nape. On the top of the crown, some red crest feathers are tipped-white. Crest is about 5 cm long when raised. The small bill is yellow. Nostrils are feathered white. Eyes are brown, with red eyelids. Legs and feet are blackish. Red-crested Turaco utters deep barking call. Male and female’s calls are slightly different, with one higher-pitched than the other, probably coming from the female. They are highly vocal, and mainly at dawn. 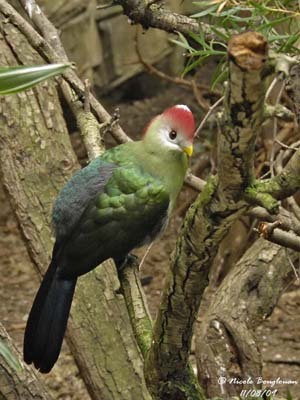 Red-crested Turaco is a forest-bird. It frequents forests, gallery-forests, forest edges, woodlands, savannahs and grasslands with trees and bushes. They occupy mostly open woodlands. 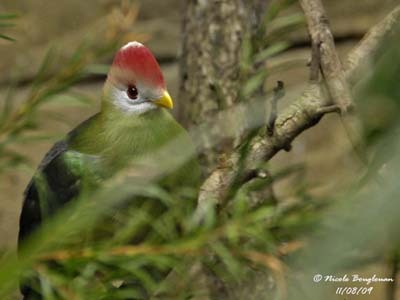 Red-crested Turaco is native to Angola. It is found south of the Sahara, from Angola to Congo. 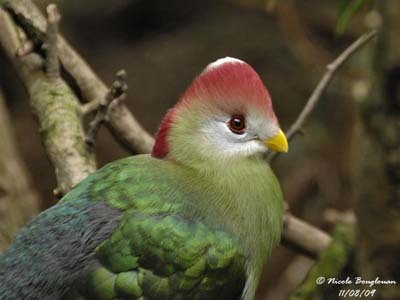 Red-crested Turaco, as other members of this family, has two copper pigments, “red turacin” and “turacoverdin”, not found in any other birds. In most of birds, these bright colours are produced by diffraction of light on the surface of the feathers, but not so with turacos. These two pigments are closely related to the habitat where the birds are living, and that is of great interest. Red-crested Turaco is often seen in groups of up to 30 birds, or in pairs. They are gregarious, but shy birds, often remaining in trees. They come to the ground only for drinking and bathing. These poor fliers move easily among the branches from tree to tree at canopy-level. 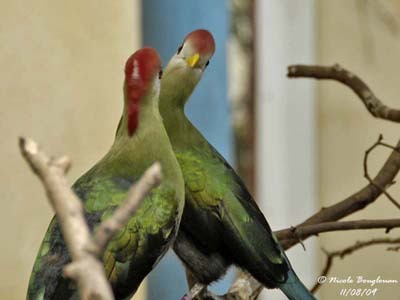 Red-crested Turaco is monogamous. Turacos are strongly territorial and may remain in family groups for long periods. During the breeding season, the male performs courtship feeding to female and feeds her too. Displays usually start with the rainy season. The birds spread the wings in order to expose the crimson patches. 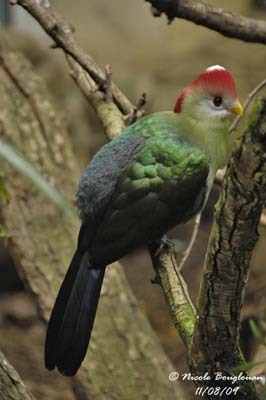 Red-crested Turaco is probably resident within its small range. Red-crested Turaco, as all the turacos, is a poor flier. When taking flight, it performs short downwards glide and some fast wing-beats to reach the next tree. Then, it climbs to the canopy with short hops. 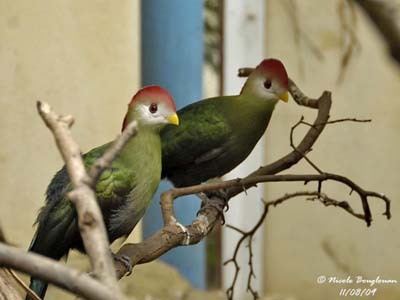 Red-crested Turaco breeds solitarily in territory strongly defended by the pair. Both mates build the flat nest with sticks and twigs. This nest is often flimsy, as those of Columbidae. It is placed among the dense foliage, between 5 and 20 metres above the ground, in trees or shrubs. Reproduction of this species is poorly known. After laying, both parents incubate by taking turns. Chicks are covered in thick down. They are fed by regurgitation, and become very active at 2-3 weeks old. They often leave the nest and climb into the branches around the nest, before to be able to fly, at about 4-5 weeks of age. They remain dependent on parents for some weeks more. Red-crested Turaco feeds mainly on plant matter such as fruits, berries, figs, leaves and seeds, and also some proteins with termites and large snails.